Katie Ganshert has a way of incorporating weighty topics into her novels without weighing down the story or the reader. She makes you think and feel, intersperses fun and light moments amidst the challenges, and ultimately ends on a hopeful note. At least that’s what I’ve observed in the three stories of hers that I’ve read so far. That’s A Broken Kind of Beautiful, The Art of Losing Yourself, and now this one if you’re counting. Frankly, I love that combination of elements in a story. In this one, there’s grief, there’s guilt, there’s surviving, there’s brokenness, and there’s picking up the pieces. Not necessarily in that order. In some ways it’s about two broken people helping each other put things in perspective and move on. It explores searching for the why behind tragedy, and it explores where comfort can be found. And there’s a tender, subtle, and emotionally satisfying love story in there too, along with a whole host of other relationships among a lifelike cast of characters. Fans of the author’s earlier books will love this one. And if you haven’t read her earlier books? Please do. Book discussion groups, and readers who appreciate a well-crafted story with complex characters, written in beautiful lyrical language, will especially want to give this one a try. Thank you to the publisher for providing a complimentary copy of the book for review purposes. Length: 12 hours, 6 minutes. Unabridged. Family, community, faith, and love. These “quilt blocks” sewn together made Ariana’s beautiful life. When they are pulled to pieces, will anything familiar remain? The Old Order Amish life Ariana Brenneman loved vanished virtually overnight with the discovery that she was switched at birth twenty years ago. Now she’s immersed in the Englischer world, getting to know her mother and under the authority of her biological father, an atheist intellectual with resolute plans to expand Ariana’s worldview. Only Quill Schlabach, a childhood friend living Englisch, can steady the tilting ground between Ariana’s two worlds, but can she trust him after so many betrayals? At the same time, Skylar Nash is forced to choose rehab or spend several months with her true relatives, the large Brenneman family and their seemingly backward life—no electricity, no technology, no fun. What the young woman can’t leave behind is her addiction to illegal prescription drugs and a deep emptiness from the belief that she doesn’t belong in either family. New ties are binding Ariana and Skylar to the lives they were meant to have. Can they find the wisdom and strength they’ll need to follow God’s threads into unexpected futures? If you read my review of the first book in The Amish of Summer Grove series, you know that Amish fiction isn’t my usual cup of tea, but that I particularly enjoyed the start of this series. Enough that I had to know what would happen next. Well, the story of the switched-at-birth Ariana and Skylar, and their friends and families, continues with Fraying at the Edge, and in my opinion, it does not disappoint. This is a satisfying middle-of-the-series read, picking up where the previous book left off, shaking up our characters’ lives in new ways, and answering some questions, while leaving others to be addressed in a future book. Ariana and Skylar both grow and change for the better over the course of this story, but their futures remain unresolved. And I for one, cannot wait for the next book…though I guess I’ll have to. I found this story very thought provoking. In particular, I was fascinated by the closer look it takes at what the Amish believe and why, as compared to the “Englisch” world I’m more familiar with. The story also takes something of an oblique look at nature vs. nurture as we see similarities and differences between the girls and their biological and non-biological families. And it was interesting to see each girl react to challenges to her belief system. I would recommend this book to fans of Amish fiction, as well as to book groups and to anyone who enjoys a good thought-provoking read. This audiobook was recorded by the same narrator who read the first book in the series, and I’m happy to report that this encore performance is just as well done as the earlier one. The narrator does a great job at giving different voices to the various characters within dialog and expressing their emotions in her reading. I borrowed a copy of this audiobook from my local library. I was not expected to write a review. But I wanted to. Length: 11 hours, 55 minutes. Unabridged. I don’t read a lot of Amish fiction. It’s not that I dislike it, or anything, but there are other genres I tend to gravitate toward first. That said, I loved this story and these characters, and I’m looking forward to reading more from this series. Ariana is a sweet and likeable young Amish girl, and I found myself rooting for her to achieve her dreams, even as complications arose to throw those dreams into disarray and cause her to question her own identity, purpose, and family ties. Skylar is a young woman with a lot of hidden pain, and while her story seems only to have started in this book, I am very curious to see how her life might be changed within a future book in this series. Quill is a particularly interesting character, and one whose perspective I can appreciate on a number of issues, particularly his perspective on faith. I will be very curious to see what the future holds for him. Hopefully something good! This book has a number of romantic threads running throughout, and I’m curious to see if I’m right about who’s going to wind up with whom. But at the same time, I liked the fact that the story takes a broader perspective than many romances, looking at a variety of relationships within and outside families. It raises many thought provoking questions on issues of identity, religion and more, leading me to wonder how I would respond if I found myself in a situation similar to the ones these characters are facing. This novel’s ending leaves me more than ready to find out what will happen with these characters in the next book. Thankfully Fraying at the Edge is already available. I just need to track down a copy. Overall, it’s a book/audiobook I would gladly recommend, but don’t go into it expecting to read just one! This story reaches a comfortable stopping point, but there are a lot of unanswered questions remaining to be addressed. Stina Nielsen does a great job narrating the audio edition of Ties That Bind. With quite a few viewpoint characters, this story must have been quite a challenge to narrate, but she makes it seem effortless! Male and female voices are well done and distinct, and characters’ emotions are clearly portrayed in the reading. I am very happy to see that the next book in the series has been recorded by the same narrator. I listened to a copy of the audiobook that was borrowed from my local library. This book made quite an impression on me. There were tears. Lots of them, at several different points. In fact, at one point, my comment to my husband about the book (because of those tears) was something like, “Enough already!” But the truth was, I couldn’t stop reading and didn’t want to, because the storytelling was just so good. This story has a very literary vibe to it, and a writing style that had me smiling again and again at little details, perfectly placed. For example, who would’ve thought an explanation of the properties of rebar and concrete belonged at the start of a schoolyard brawl, but I couldn’t help but admire how well the incongruity worked. And certain scenes have really stuck with me in vivid detail. As much as I enjoyed reading the book, I did have my reservations about how the story ended, specifically the twist revealed late in the book (which I won’t spoil for you). I’ll just say that a certain decision by the main character really bothered me, and leave it at that. The faith element in this one felt pretty minimalist. I really only recall explicitly Christian elements in a handful of scenes, so it wouldn’t surprise me if this book would appeal to general market readers as well. Thief of Glory gets my recommendation, particularly for discussion groups and those looking for a literary read with a distinctive voice. However, anyone particularly squeamish, may find some scenes… challenging. I am glad I read this book, and feel like I learned a lot from it, both about the history of that time and place, and about memorable storytelling. Thank you to WaterBrook Multnomah for providing a paperback copy of this book free of charge. It’s up to the warrior angel Validus and his hand-picked team of heavenly agents to protect the unbelieving Drew. Validus now knows that the young man is at the epicenter of a global spiritual war, and the angels must use a millennia of battle experience to keep Drew alive, for the Fallen want him dead. Surrounded by spiritual warriors and targeted by demons, Drew’s faced with an impossible decision that will forever alter the destiny of America…and his own soul. 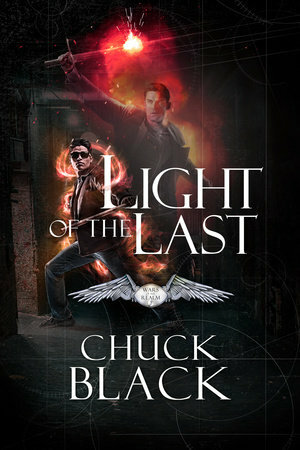 Light of the Last is another action-packed read from author Chuck Black. It follows Cloak of the Light and Rise of the Fallen, as third in the Wars of the Realm series. For those unfamiliar with the series, I’d describe this novel as part political thriller, part super-hero story, and part speculative fiction exploring spiritual warfare. Incidentally, if you haven’t already, you’ll want to start this series with its first installment, so consider checking out the links above to my reviews of the earlier books. The key viewpoint characters in this novel are Drew Carter who was featured in Cloak of the Light, and Validus the warrior angel featured in Rise of the Fallen who is tasked with protecting Drew. Both characters feel larger than life with their superhuman abilities and unwavering dedication to the goals for which they’re fighting. Supporting characters like Ben, Sydney, Reed, Ross, Jake, Validus’s angelic team, and Ben’s team of tech geeks fill their roles well and keep the plot moving ever forward. Speaking of the plot, it’s full of twists and turns. From spy training to missions, to reconnecting with significant characters out of earlier books, to questioning reality, to facing down an utterly terrifying threat on a national scale, Drew and Validus, and their human and angelic teams are constantly on the move. The pace follows a quick clip, and while description is very precisely detailed in some parts (particularly fight scenes) there are other parts of the plot that get summarily told to fast-track the reader to the next exciting part. Not necessarily a bad thing, but also not the style I’m accustomed to reading, so it kind of jumped out at me. There was one unexpected plot twist in Chapter 24 that made me consider not finishing the book. I don’t want to spoil anything for anyone, so let’s just say that I’m unusually squeamish when it comes to plotlines involving biological threats, and I tend to avoid them whenever possible. But I didn’t see this one coming until I was already so deeply committed to finding out how the story ends that I couldn’t bring myself to give up on it. Thankfully, despite a few pretty intense scenes, I managed not to freak out…too badly. This story emphasizes the power of prayer and looks at what it means to trust and to follow God. It also explores one fascinating view of what could be going on in the spiritual realm. I appreciate the effort the author put into creating a reader’s guide to delineate which elements of his take on spiritual warfare are drawn from the Bible and which are guesswork and/or invention, much as an author of historical fiction might point out where historical liberties were taken for the sake of the story. Anyway… if you enjoy books full of action, intrigue, and super-human fight scenes, this may very well be one you’ll love. Just be sure to start with Book 1, Cloak of the Light. I’ll be curious to see if there are any more titles in this series or perhaps a spin-off series yet to come. The ending seems to leave an opening for that possibility. Thank you to WaterBrook Multnomah for providing a complimentary copy of this book for review purposes via the Blogging for Books program. Willa is a woman caught between two worlds. As tensions rise, challenging her shielded heart, the woman called Burning Sky must find a new courage–the courage to again risk embracing the blessings the Almighty wants to bestow. Is she brave enough to love again? Burning Sky came to my attention quite some time ago, when it won not one, but three Christy Awards in the 2014 awards cycle. It won in both the first novel and historical categories, as well as receiving recognition as Book of the Year. Wow! So this one was already on my wish list when I saw that Recorded Books was releasing an audio edition. As you might expect from an audiobook lover like me, I was thrilled to learn about the new edition and I leapt at the chance for a review copy. This book is well worth the listen! The story lived up to my expectations, with a deep and multifaceted plot, believable characters who have a lot at stake, and immersion in vivid historical details from a fascinating time in American history. Willa / Burning Sky is a strong and compelling heroine, caught between two worlds, facing seemingly insurmountable challenges, but determined to make a life for herself, even after suffering heartbreaking losses. Her character growth and healing make for a great story. And the suspense, mystery, and romance unfolding along the way makes it all the more captivating. This book is a must-read for fans of historical fiction who haven’t already read it. The narration of this audiobook by Saskia Maarleveld is excellent. The pacing is just right, narration spoken in a clear and pleasant voice, and the character voices stand out as unique and perfectly suited to the characters. The children’s voices struck me as some of the best I’ve heard among audiobooks read by adult narrators, and Neil MacGregor’s accent is simply wonderful. Whether this is your first time reading the book, or if you’re considering reading it again, I highly recommend the audio edition. The copy I received initially had a few tracks out of order, but I was pleasantly surprised to find a brand new and corrected copy of the audiobook on my doorstep a few weeks later. Gotta say, I’m impressed that Recorded Books went to the trouble of sending a replacement without my even having to ask. I think it really shows they care about the quality of their product and stand behind it. A big thank you to Recorded Books for providing a complimentary copy of this audiobook for review purposes (and for sending a corrected copy). All opinions expressed are mine alone. This is a story full of raw honesty, brokenness, grace, and hope. It’s told from two distinctive first person viewpoints. Carmen – a married woman grown distant from her husband under the strain of six miscarriages, who tries to put on a perfect façade for the outside world. And her teenage half-sister Gracie, who has run away from their alcoholic mother, in hopes of returning to a place where she once felt appreciated. The story feels real – the characters, the situations, the emotions, the relationships, and the setting. All of it. I enjoyed coming along on the sisters’ journeys as they grow and develop in their relationships and their personal faith. And I love the fact that the characters’ problems aren’t downplayed by a too tidy ending, and yet there is a hopeful and satisfying resolution complete with an inspiring look at grace and trust. One of my favorite parts of the whole book is when Carmen looks back at a series of what could have been seen as coincidences, and instead sees “evidence of a God who orchestrated even the most mundane details for our good” (Page 300). I brought this book along with me on a weekend trip to the beach and devoured it in the shade of a beach umbrella. Since the book was set partly at a beach-side motel, it turned out to be a particularly great fit for the weekend. I highly recommend both book and beach, taken together or separately. Author Katie Ganshert’s Christy Award winning A Broken Kind of Beautiful was among my favorite reads of 2014, and this latest novel by Katie Ganshert could well be among my favorites for 2015. I think Book Groups will find it an excellent choice for discussion, and in fact, it includes a discussion guide. Thank you to WaterBrook Multnomah for providing a paperback copy of this book as part of the Blogging for Books Program in exchange for my honest review. For months now, I’ve been eagerly anticipating this, the second book in Chuck Black’s Wars of the Realm series. I assumed it would continue Drew Carter’s story from where the first book, Cloak of the Light, left off. (You can find my review of that book on the Edgy Inspirational Romance blog, if you’re interested.) I was already thoroughly invested in those characters – Drew, Sydney, and Ben in particular – and in their plight, and wanted to know what came next. Honestly, this book was not what I was expecting. Let me hasten to clarify, I don’t mean that in a negative way, because I thoroughly enjoyed reading this story too, and I think that what comes next in the series will have even more impact, for having had the extra groundwork laid in this book. I just had to wrap my mind around the shift in perspective and scope of this book before really digging in to enjoy it. But enjoy it, I did. This book interweaves two main storylines, both told from the perspective of Validus, an angel we first met in Book 1 through his interactions with Drew Carter. Throughout this book, there’s a “Present Day” storyline in which we see the same timeframe of Book 1 retold from Validus’s perspective, first as he serves as Primus Commander for the angelic forces in North America and later as he fights to protect Drew. Interwoven with this retelling are a series of chapters exploring spiritual warfare throughout Biblical history as experienced by Validus and his fellow angels. I enjoyed getting to know Validus better and getting a “behind the scenes” glimpse into what might have been going on in the spiritual realm during important moments in Biblical history like Noah’s flood, the Tower of Babel, and Jesus’ birth and crucifixion. The Reader’s Guide in the back was great for delineating which aspects of the story were drawn from Biblical accounts and which were more speculative. With its emphasis on action, adventure, and heroics, this is a story I would expect to have great appeal for teen boys in particular, as well as anyone enjoying a fast-paced and exciting story. Battle scenes were described blow by blow to the point I could almost have been watching the story play out on the big screen (and yes, I would love to see this series made into a movie). There were quite a few scenes in this book that got my adrenaline going and gave me no choice but to keep turning pages! Thank you to WaterBrook Multnomah and the Blogging for Books program for providing a copy of this book for review purposes. Redeeming Love has over a million copies in print and has been through several editions since it was originally published in 1991. I just finished reading the 2005 edition, which includes a study guide by Peggy Lynch with some really thought provoking discussion questions. As I write this review in December 2013, Redeeming Love remains on the ECPA and CBA Best Seller Lists. I think the case can be made that this book has become a classic of Christian fiction. I am happy to have read it and I would recommend it highly to Christians and non-Christians alike. It can be read as an allegory with significant Christian themes, exploring God’s unconditional love, even for those who don’t feel worthy of that love. And it can be read as a beautiful and emotional love story between two very complex and memorable characters. Redeeming Love is set in California during the time of the Gold Rush. It tells the love story of a godly man named Michael Hosea who is called to marry a prostitute known as Angel. She is a beautiful woman who was sold into prostitution as a child, and feels herself incapable of loving Michael back or living any other kind of life than the one to which she is accustomed, despite the unhappiness it brings her. Michael loves her continually and forgives her repeatedly, despite the pain she brings him, and God uses this to begin the process of redemption in Angel’s life. But it isn’t until she comes to know God’s unconditional love for herself that her redemption can be complete. I found this to be an engaging and deeply moving story that dealt with tough issues revolving around sin, shame, and forgiveness in a very tender hearted way. The allegory is there, just as it is in the Book of Hosea from the Bible on which this story is loosely based, but it’s subtly woven into the fabric of the romance and doesn’t feel at all forced or contrived. The prologue sets up the story by describing Sarah’s childhood and how she came to be the woman Michael would know as Angel and later as Amanda. It goes a long way toward making her feel real, believable, and sympathetic, even when her actions might tend to make her seem cold-hearted and unsympathetic, much as she is seen by Paul and other characters who do not know her well. “Head-hopping” is a storytelling technique that has fallen out of vogue in recent years, in which the viewpoint from which the story is told jumps from one character’s thoughts to another character’s thoughts and back within a single scene. The argument against head-hopping, is that these jumps can confuse the reader and prevent him or her from developing a close rapport with a single character. In some cases, I think that can be an issue. In this case, I thought the technique was handled deftly with clear clues provided each time the viewpoint was changed preventing confusion. And I thought it added depth to the story to be able to see it from multiple viewpoints more or less at once. Given the dichotomy between Angel’s thoughts and actions and the way her actions were interpreted by other characters, I think the technique played a useful role. This story moved me to tears at a couple of points near the end of the book. I felt my heart breaking right along with Michael at some of the decisions Angel made over the course of the story, but I just had to keep reading to see how it would end. Redeeming Love was a beautiful exploration of love in all its manifestations from the platonic love of friends to the love between a husband and wife, to self-sacrificial love, to the love of God for mankind. All in all, an enjoyable and thought provoking read. Highly recommended. As I mentioned before, the 2005 edition of Redeeming Love comes with a study guide with scripture references and some excellent questions for book discussion groups at the back of the book. Some of the questions deal with the story itself, and others deal with applying its themes to our lives. For those with a different edition of the book, many of those same discussion questions can also be found on the author’s Web site.